Weekends go by so quickly when you work full-time; it seems as if every Saturday and Sunday, combined, are the length of a morning in the working world. There are so many things to do — errands to accomplish, chores to tackle — and on top of it all, the precious time to be had with the kids. There are playgrounds to be conquered; tickle wars to wage; and outings to be shared. How we squeeze as much into these two days each week as we do is a wonder to me. How I manage to want to get into the kitchen at all, much less at any length, is sheer mystery. But I get there. I always get there, especially on Sundays. Making dinner for the family is as much a ritual as bedtime stories. And as bittersweet as it is to gather everyone around the table on a Sunday evening, knowing that it’s the last meal of the weekend and we’ll all be back to busy routine the next morning, it’s still one of my favorite parts of the week. The food for Sunday dinner is always extra-good, we’re usually a little more relaxed after a weekend of play, and I have the comfort of knowing that J. and I are upholding something that was a tradition, in one form or another, as we both grew up; something we can pass down to our boys. This weekend my Sunday kitchen hours were spent in pursuit of livening up old routines. When you cook as much as I do, it can be tempting to fall back on tried-and-true favorites and not shake things up too greatly — sometimes, speed and efficiency just win out over ingenuity. But of course, it’s only through experimentation that I can find new favorites for the family, so I do my best to force myself to constantly tweak, reinvent, and evolve the things I know how to make (and my family knows they like to eat). Hm. Why, exactly, was I going to make baked ziti? On a whim, I wrote down “Baked Penne Florentine” instead. In my head, I was picturing something with some greens in it, but still comfortingly oozy and baked and cheesy on top. I didn’t know what it would be, precisely, but I never let little details like that bother me when I’m meal planning. Even yesterday, when I picked up a container of locally made fresh ricotta cheese at the store — totally on a whim — I STILL didn’t know what this dinner creation was going to look like. 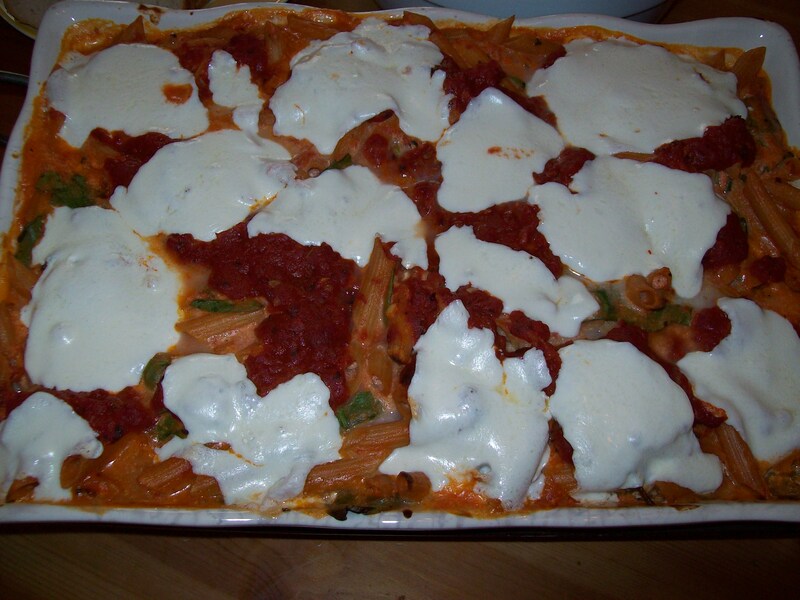 In the end, I just made a really good, really appetizing, far superior (in my book) version of…baked ziti. Except I made it with penne, two different sauces, beautiful fresh local cheeses, and plenty of spinach. It wasn’t hard, really; there was something satisfying, in fact, about the whole process of stirring two sauces, blending them together, and trying to find just the right mixture of flavors to make the dish as good as it could be for our Sunday dinner table. And luckily, as is usually the case with a sturdy baked pasta dish, it didn’t need anything fussy alongside; just some good bread and a big green salad with lemon and olive oil was all it took to round out our meal. However, this being Sunday, and a week having passed since the birthday cake…we needed dessert. Oh, nothing fancy. Cookies. Cookies always fit the bill, and there’s something inimitably homey and comforting and exactly right about the smell of cookies in the house on a weekend. (Or, let’s face it, anytime at all.) I didn’t want to go crazy with super-rich cookies, but I thought I’d whip up a batch of our old go-to banana oatmeal cookies and be able to slip a few into the kids’ lunchboxes this week. Simple, safe, easy — until I opened the pantry and saw the cocoa powder. I don’t need to tell you what he answered (what would ANY four-year-old answer, when faced with a chocolate or no chocolate proposition?). And so it came to be that our old familiar banana oatmeal friends were spruced up with a hit of cocoa powder and a little shot of molasses to deepen the color and flavor. The results were moist, fudgy, with the same soft cake-y texture as the original cookies and the nutty crunch of the oatmeal; but so much more decadent. The originals are darned good, but they sort of TASTE like healthier cookies. These cocoa cousins of thers decidedly do not. I’ll always preach the virtues of knowing how to make several things well, and continuing to make them often — it’s a practice that not only instills confidence in the kitchen, but generally just helps to get everybody fed 1) well; 2) consistently; and 3) with as little fuss as possible. But days like today remind me that it can also be satisfying to just slightly vary those old familiar recipes and see what the results are. You might get a welcome change, as in the case of the penne Florentine; or, like the cookies, you might find that there’s been something missing from your favorite recipes all along. This entry was posted in Cooking, Feeding kids, Meal planning, Parenting and tagged baking, cookies, cooking, family, food, Household organization, meal planning, parenting, recipes, Sunday dinner. Bookmark the permalink. They ARE great. They’re like banana bread on crack. 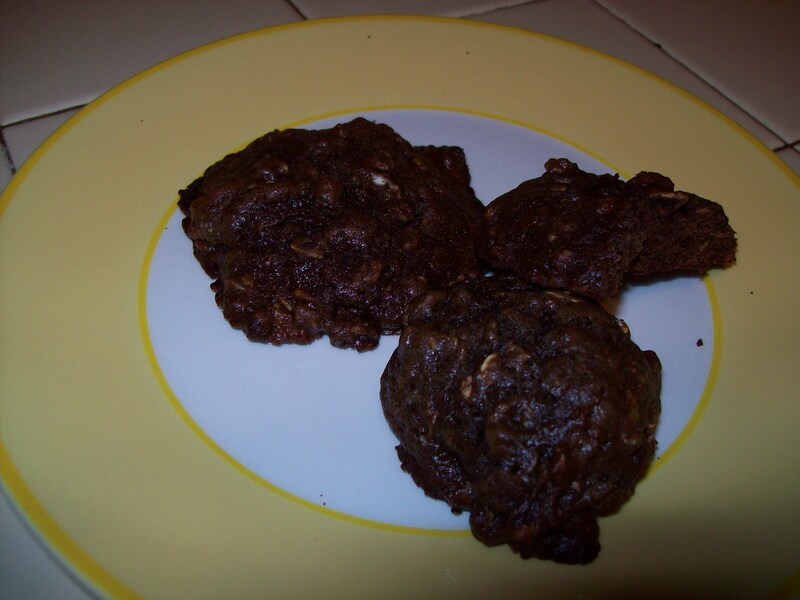 😉 My kids beg for banana cookies…now they’ll never let me make them without the cocoa powder again! Banana bread and crack. Love it! Yummy! It all looks amazing! Is your cookie recipe up?